We're now just between Tri Camps: our first successfully completed and second about to start later today with 17 people on their way to join another two customers already out here. 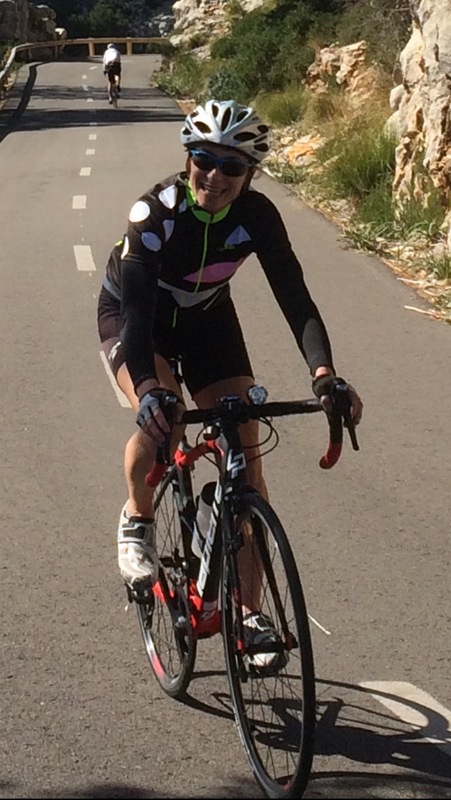 And we're delighted that top coach and friend Leanne is joining us as part of our coaching team, with husband Tom taking on Ride Leader duties. Leanne and Tom have been out a few days already, getting to know the set up, familiarising themselves with some of the bike routes and also leading some great Strength & Conditioning and stretch sessions. This last week has flown past so quickly and been so much fun. Big big thanks to our two first customers, Vicky and Phoebe, who have been such a delight to get to know and swim, ride, run, stretch and generally have a good time with. These last few days we've also been joined by Cathy, albeit for a shorter break. Our routine of daily swims really seems to have benefitted both regulars. Vicky finished her last swim yesterday saying "that's the best I've ever felt swimming." And Phoebe is saying she's found muscles working that she previously didn't know were there as her stroke has progressed through the week. The photos tell their own story of the super routes we've covered in this last week - again Vicky in particular going further, faster and higher than ever before. Coffee stops have been a theme. And you may spot some new smart kit too as a few of the rides also incorporated spending sprees in fancy bike shops. What else? Some relaxing recovery runs in the nearby nature trails, stretching and S&C sessions at the beach, bubbling around in the hotel's hydro spa (including daring each other to use the plunge pool and ice scub) and generally enjoying getting to know each other and share the time together. In half an hour Leanne and will be off to the airport to meet and greet our next group - quite a bit larger but I know they'll all have great time.